For some time, I've been meaning to add a radio to my Jr. Go Bag. I figure it would be helpful for entertainment purposes and emergencies. There are a number of low cost, compact, high quality'ish FM/AM options out there, but none of them were every low-cost, compact or high quality enough for me to pull the trigger on them. On a whim one day, I Googled for Android USB Radio and discovered the world of Software Defined Radio. Sounds expensive and complex, right? Actually, it's just the opposite. For less than $10, you can buy a USB stick which works with SDR Touch, an Android app that uses the stick to pull in radio signals. My original goals of cheap and compact have been met*. It's hard to say about the quality compared to other radios, but there capability definitely exceeds expectations. Being able to pull in seemingly random signals (like the the Air Traffic Control) is just too cool. 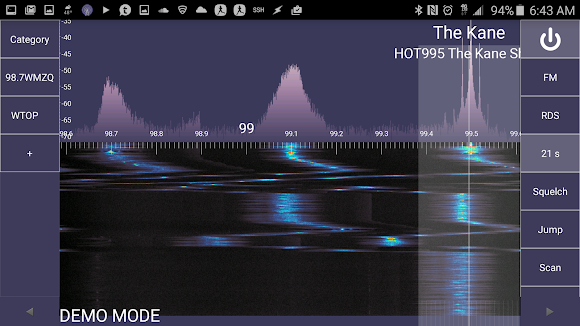 And SDR Touch offers some impressive features, including the ability to record incoming audio. I've still got a lot to learn about Software Defined Radio. But I've got to say, it's not often you stumble on technology that's so inexpensive and yet so very powerful. * OK, mostly met. I still need to optimize the antenna, which is a bit bulkier than I'd like.